Comfrey: a “wonder-weed”. 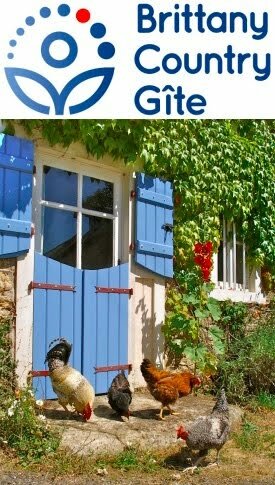 I started my French adventure down in the Limousin region. I’d already bought some willow rods and comfrey before I decided to move and start again, so I was lucky to have some good friends who let me plant up my stock to preserve it. Luke and Erica, with their children Max and Laurie, arrived last night with, amongst other things, our stock of comfrey lifted from their garden that day and carefully wrapped in wet newspaper. It really isn’t the right time of year to move plants but I couldn’t pass by this opportunity to get our comfrey patch started. Our experience of moving reasonably robust plants in summer is to pre-water the hole, water them in, then keep watering regularly and, although the plant will wilt terribly and look awful, new shoots will appear within a couple of weeks and the plant will survive. 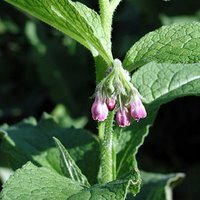 Why comfrey? The rhizome and its finger-thick branched roots mine the subsoil of certain nutrients. It’s best known for potassium but also accumulates calcium, iron, and a little phosphorus (see pp49-50 of Patrick Whitefield’s The Earth Care Manual: A Permaculture Handbook for Britain and other Temperate Climates. These mined nutrients become available in the leaves and can be used to improve topsoil and feed plants by: cutting and laying the leaves to wilt and decompose on the surface, filling a plastic tub with leaves and letting them rot down to become comfrey “tea” or simply adding leaves to the compost heap; all of which release the nutrients. Grazing animals can even benefit from eating it. Comfrey is a vigorous plant and, if you’ve ever wondered why useful plants don’t grow like weeds, then this is one exception. However … “it’s almost impossible to remove once established”, so be sure where you want it before planting and always use Russian comfrey, which doesn’t spread by seed as ordinary comfrey does and is propagated by planting short root cuttings. This is the strain we have and we bought ours at Ragmans Lane Farm and it’s survived a couple of transplants. Comfrey also, apparently, has several medicinal uses, my favourite being the suggestion by Gerard, who wrote in 1597 that Comfrey should be “...given to drinke against the paine of the backe, gotten by violent motion as wrestling or overmuch use of women".